The seed is the Word of God. – Luke 8:11. Yes, the seed from which the fruit of faith and salvation grows is the Word of God. But why, O why do so many that hear the Word of God nevertheless not believe and obtain salvation? It is with the Word as it is with the seed which a sower went out to sow. 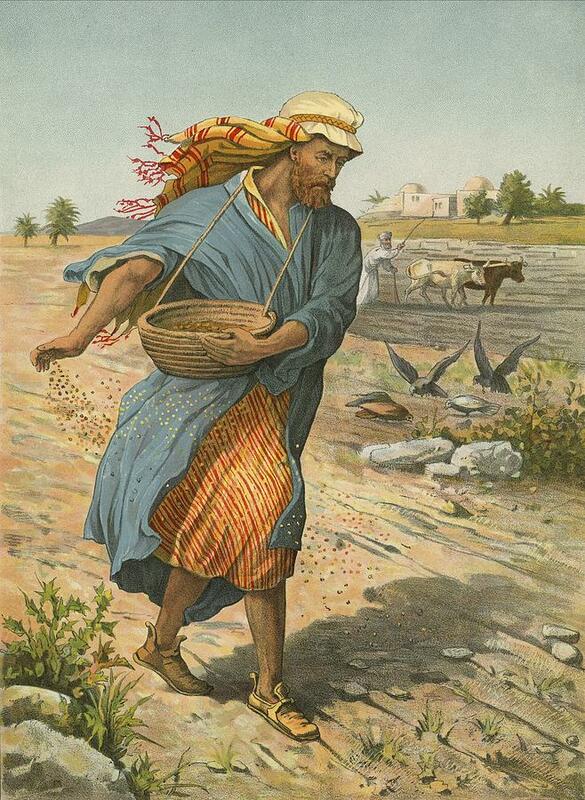 As he sowed, some seed fell by the wayside; and it was trodden down, and the fowls of the air devoured it. Thus many who hear the Word do not allow this divine seed to enter their hearts; it lies loosely upon the surface. Then cometh the devil and taketh it away, lest they believe and be saved. And some of the sower’s seed fell upon a rock; and as soon as it was sprung up, it withered away because it lacked moisture. Thus many receive the Word with joy; but they do not let it take deep root. For a while they believe, but in time of temptation they fall away. Still other of the sower’s seed fell among thorns; and the thorns sprang up with it and choked it. Thus many allow cares and riches and pleasures of this life to choke the Word of God, so that it brings no fruit to perfection. Hence it is not the Word’s fault that so many do not believe and are not saved, but it is their own fault. Some seed, however, fell on good ground, and brought forth fruit a hundredfold. Thus some hear the Word of God, and keep it in an honest and good heart, and bring forth fruit with patience: they become believing children of God, they produce the fruits of faith (good works) in their lives, and in the end obtain salvation by the mercies of God in Christ Jesus. Such do not become believers as a result of any good conduct on their part, but purely by the grace and power of God through the “seed” of His Word (Luke 8:4–15). O my dear reader, which ground do you resemble? PRAYER. – Almighty God and Father, who didst make heaven and earth and who hast prepared salvation and eternal blessedness for us, and didst abundantly scatter the heavenly seed of Thy divine Word among us, I give thanks to Thee for these, Thy gracious gifts and treasures. I beg Thee so to prepare my heart by Thy Word and Spirit that I may be good ground, guarding myself against false confidence, indifference, instability, care, greed, and lust. With Thy gracious Word taking firm root in my heart, help me patiently to endure every heat, storm, temptation, and tribulation that may afflict me, that in an honest and good heart I may bring forth rich fruit—praising and honoring Thee now and forever. Amen.